I've never been one to go for the strong, night-time fragrances. My scent choice always lies in fresh, light florals. Naturally sweet and not too overpowering. I've been neglecting quite a few of my floral fragrances during the winter months, choosing the same perfume each day. However now that Spring is here, it's time to break out the old favourites and introduce some new additions too. I've had my Lancome La Vie Est Belle perfume for quite a while. Not because I don't use it but it's amazing staying power means you only need a tiny spritz at a time. For instance, my mum used it this morning and the scent still lingered for the rest of the day. The main flower in this scent is magnolia, which is actually one of the first flowers to bloom in Spring so it's perfect timing. Perfect for those who love sweet scents and amazing staying power. I'm sure we're all no stranger to the Be Delicious Perfumes but DKNY Be Delicious Skin Fresh Blossom is a little bit different. For those who find perfume too drying for their skin, this actually adds an element of moisture to the skin in every spritz. While it does have a fruit aspect to it, I think the floral scents definitely take over with a clean floral freshness. This beloved Coach Poppy perfume has been in my possession since 2012 and I've been rationing it ever since. The notes of jasmine, gardenia blended with fresh cucumber and candied rose petals add just the right amount of sweetness without being too sickly. I have the tiniest amount left and once I've used up a few more of my fragrances, this will definitely be topping the repurchase list. What would a floral spring fragrance post be without Marc Jacobs Daisy? A classic perfume which never gets old. I will admit it often gets overlooked in my collection as it's quite a simplistic fragrance but now that Spring is around, I'm definitely going to wear it more often. It's one of those no fuss perfumes where you can throw it on without a second thought, it's always going to go down well for any occasion. Plus, who can resist the gorgeous daisy packaging? You can always rely on Diptyque to get their florals right and Diptyque Olene is no exception. My favourite flower/plant is jasmine and although it appears in the majority of my fragrances, it's never usually alone. This is a pure jasmine perfume, the purest I've ever came across without actually being beside a jasmine plant. Though it is an eau de toilette, it applies much more like an eau de parfum and I often think to myself after a few too many spritz: "oh my god what have I done!" It's seriously strong stuff so you only need a tiny amount and if you're lucky, you might see it pop up in the Space NK sale every now and then. 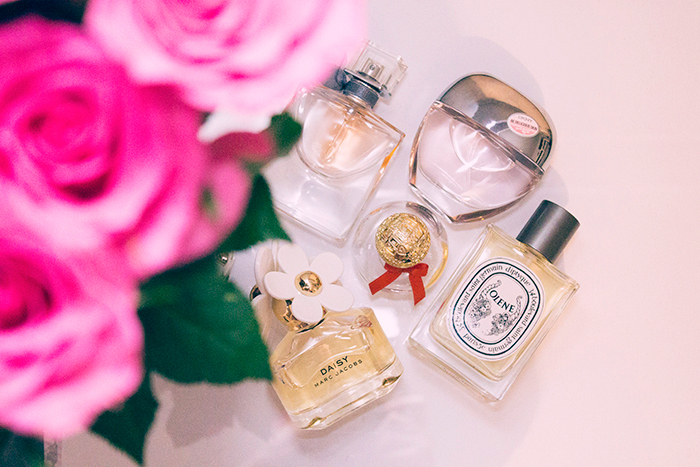 That is my floral Spring fragrance picks! Now if only we had some lovely Spring weather to match..